ESTERO, Fla. - The Florida Everblades (1-2-0-0, 2 PTS) seek a series split with the Norfolk Admirals (2-0-0-0, 4 PTS) on Saturday night at Hertz Arena, the final meeting between the two division foes in Florida this season. Goaltender Merrick Madsen turned away all 32 shots he faced, backstopping the Norfolk Admirals to a 1-0 win over the Everblades with his first career shutout in his professional debut on Friday night. Matt McMorrow scored the game's only goal, a tally assisted by Taylor Cammarata and Ben Duffy at the 11:42 mark of the opening period. Florida turned up the pressure in the third period and had a 14-4 edge in shots on goal in the final frame but couldn't solve Madsen. Josh Wesley (FLA) - Currently under contract with the Carolina Hurricanes, Wesley has been one of the most offensively active blue liners in the ECHL this season. Through three games, he is fourth among league defensemen with 12 shots on goal. Wesley was tied for the team lead with four shots on goal in the series opener on Friday. Taylor Cammarata (NOR) - A University of Minnesota product, Cammarata helped set up the lone goal on Friday night and was tied for the team lead with his three shots on goal. The Plymouth, Minnesota, native posted 31 points in 49 games in his rookie season of pro hockey last year with the South Carolina Sting Rays and has three points through two games this year. Florida has allowed the sixth-fewest shots on goal per game and yielded a single-game low 24 shots on goal on Friday, including a single-period low four shots on goal in the final period of regulation. The previous low was eight shots on goal in the third period of a 3-2 win last Saturday against Newfoundland. 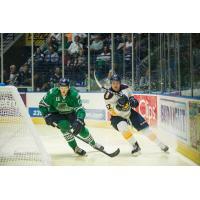 The Everblades have excelled on the penalty kill through three games, killing off all six opponent power plays. There are seven ECHL teams with perfect penalty kills. Florida has averaged just eight penalty minutes per game this season, the fourth-fewest penalty minutes per game in the ECHL. However, the 'Blades were assessed a season-high 18 minutes of penalties on Friday night. Florida and Norfolk will meet five times during the 2018-19 season, including two games in Estero and three in Norfolk, Virginia. In six matchups last season, Florida earned a 5-0-1 record. Of the five Everblades' wins, only one came by less than three goals. Florida made several transactions this week, which included the additions of Nathan Perkovich, Justin Auger, and David Friedmann. There are 10 players on Florida's current roster who were NHL Draft picks, a list that includes Jordon Southorn, Josh Wesley, Steven Lorentz, Nathan Perkovich, Kyle Platzer, Justin Auger, John McCarron, Zach Nastasiuk, and goaltenders Jeremy Helvig and Jamie Phillips. Nastasiuk was the highest NHL Draft pick and was selected in the second round, 48th overall by the Detroit Red Wings in the 2013 NHL Draft. Florida is coming off the best season in its 20-year history after posting a team record 112 points and 53 wins on the way to the second Kelly Cup Finals appearance and the third Brabham Cup Championship in team history. In addition to qualifying for the postseason in 19 of its 20 seasons, the Everblades have captured six division championships and four conference championships. Florida won the 2012 Kelly Cup. Following Saturday night's contest, the Everblades will play 10 of their next 13 games away from the confines of Hertz Arena. That stretch includes a season-long seven-game road trip from Nov. 14-24. The 'Blades travel to face the Orlando Solar Bears next Friday night before returning home on Saturday for the home-and-home finale with Orlando. Saturday is Nickelodeon Night and Sweets in the Suites, featuring a VIP Pineapple Party before the game with SpongeBob, Patrick, Squidward, and Mr. Krabs and all you can eat burgers, potato wedges and beverages. To purchase the Pineapple Party Package or for more information, contact Ali O'Connor with the Everblades at 239-948-7825 ext. 1500.